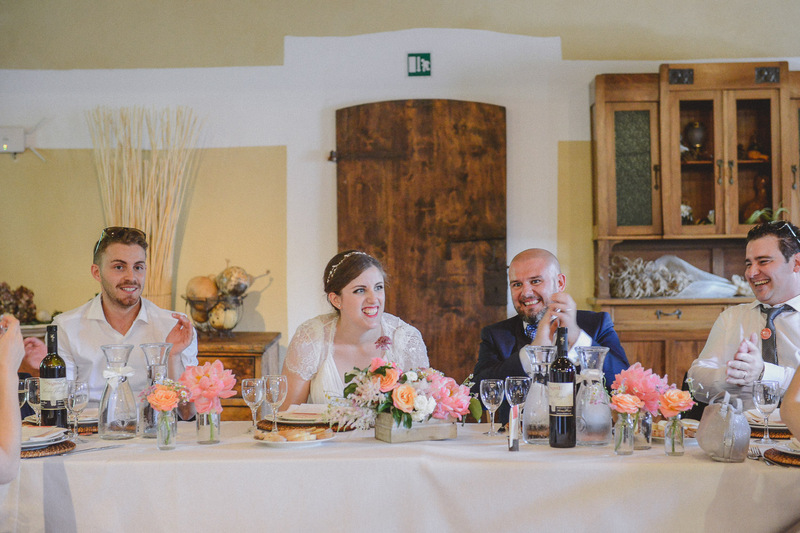 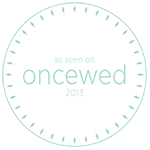 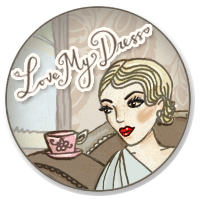 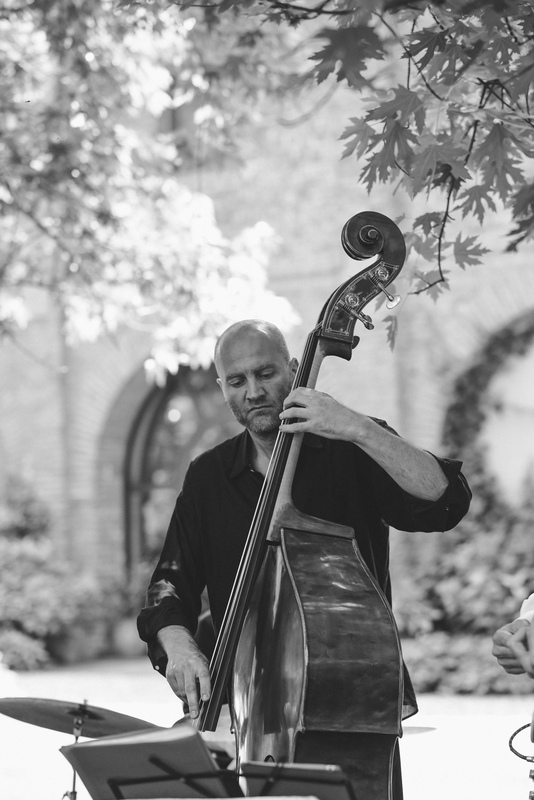 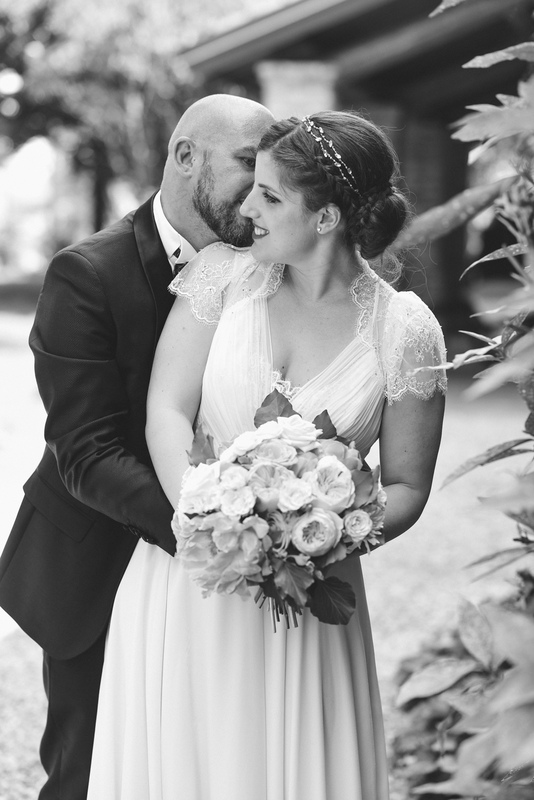 So happy to share with you this wedding of the last season! 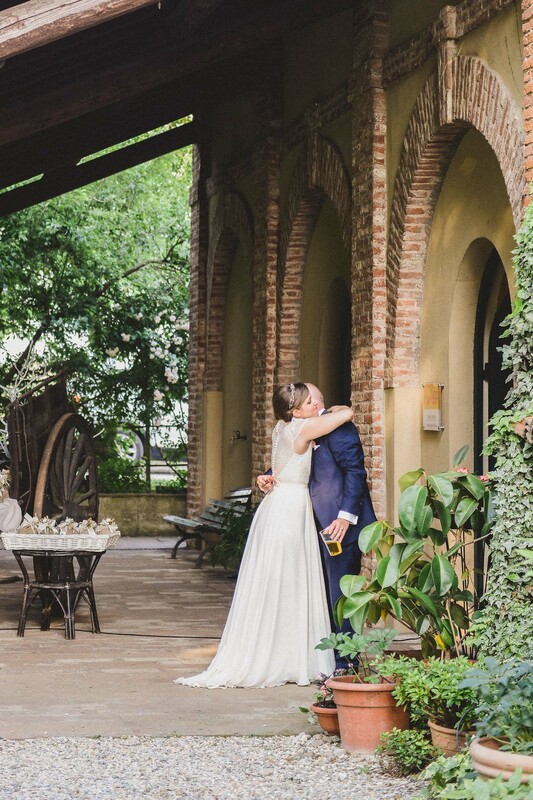 I’m in love with this couple and it’s nice how the wedding was only the beginning of a nice relationship with me and my staff. 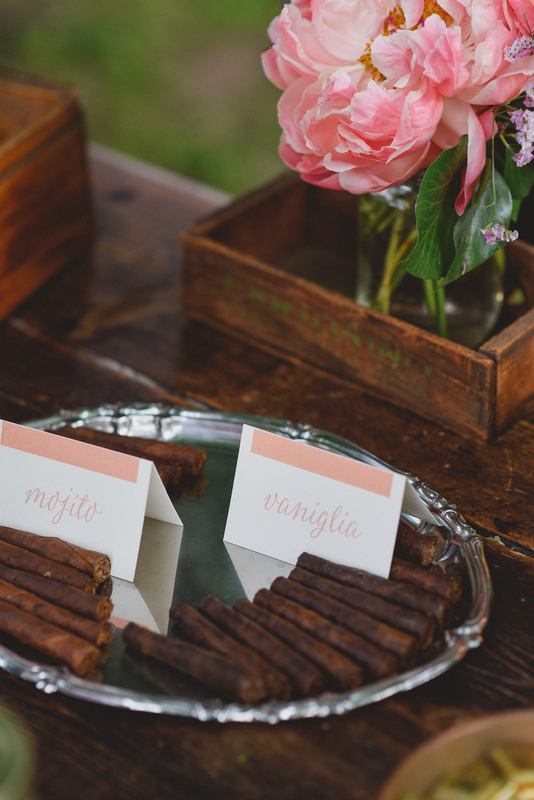 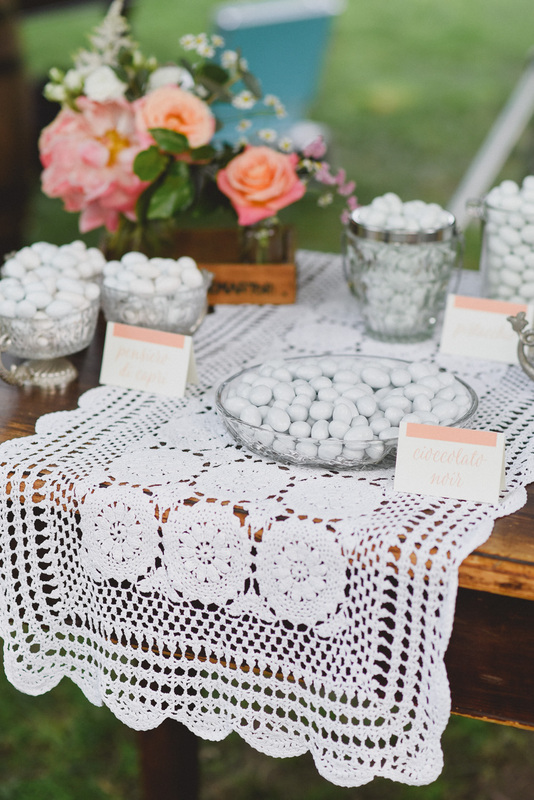 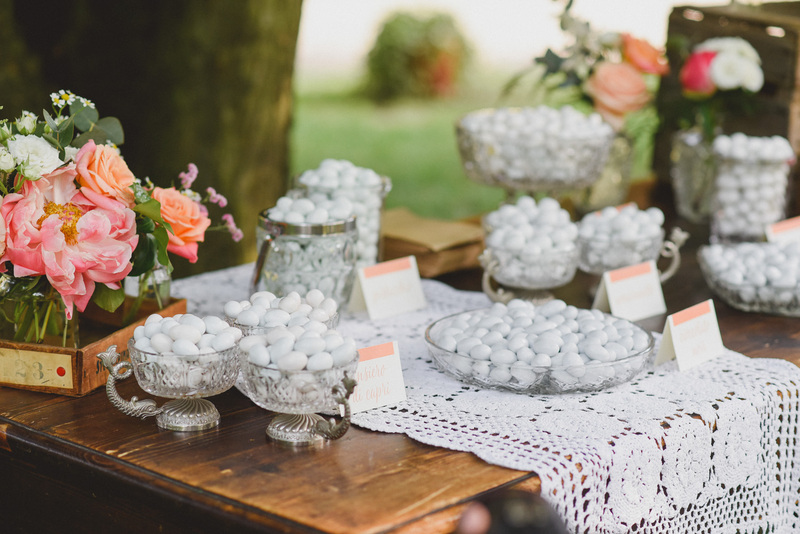 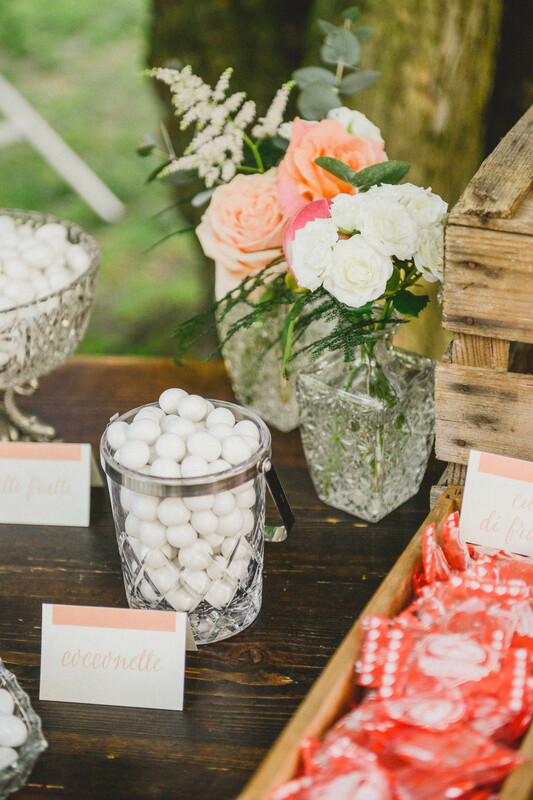 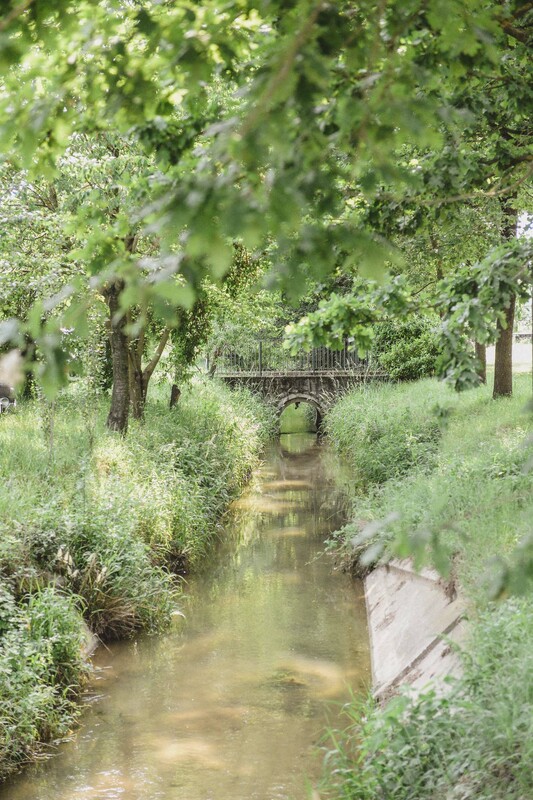 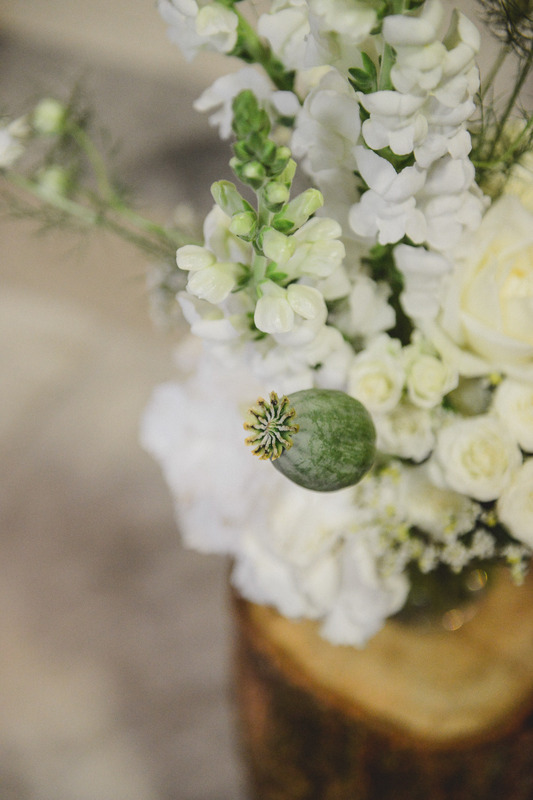 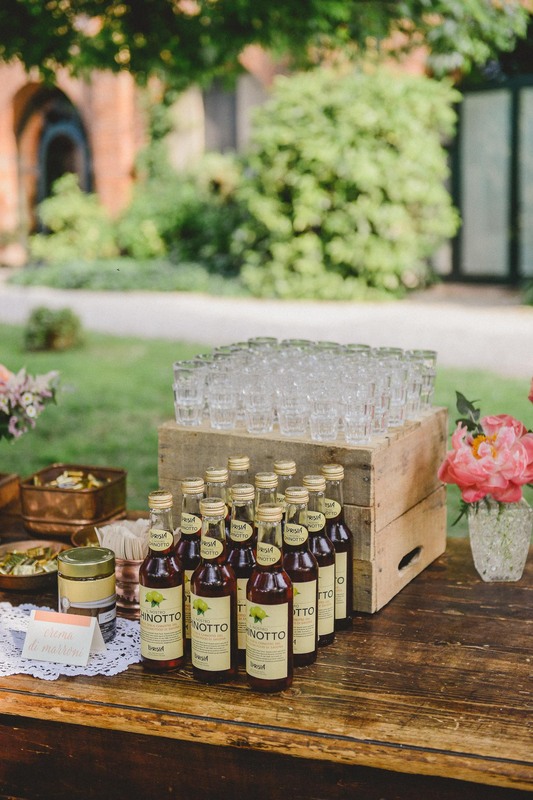 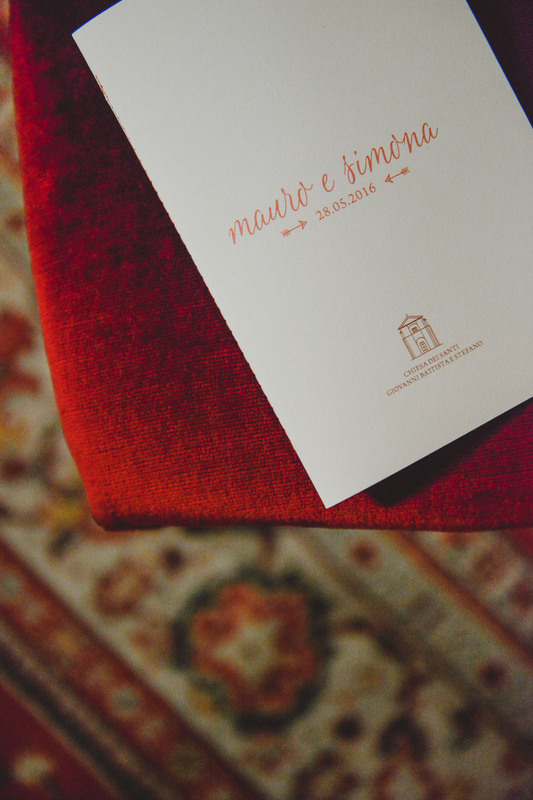 We studied all the details about their wedding to create a matching between rustic and vintage-chic. 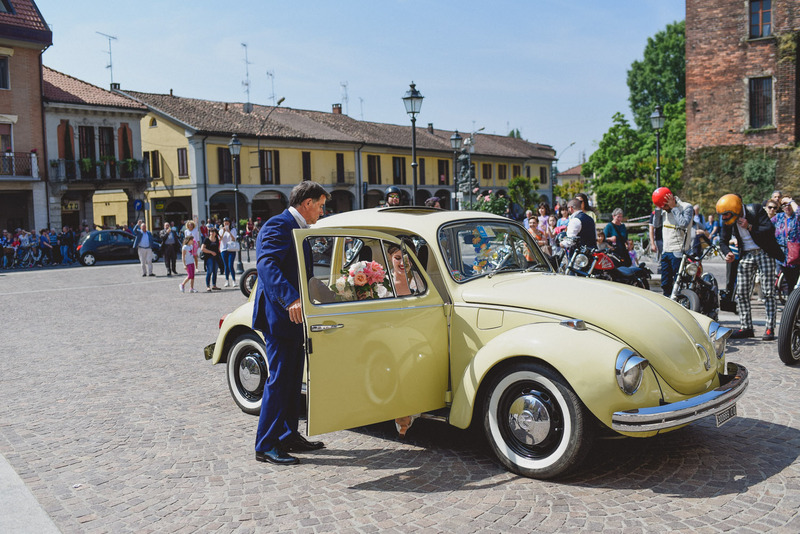 It was funny because one of the first topic in our meetings was a Volwsgwagen beetle and “Bee” was one the protagonist of the whole story bringing the bride and the groom to the church and then to the reception (and after the wedding for their honeymoon all around Italy ; ). 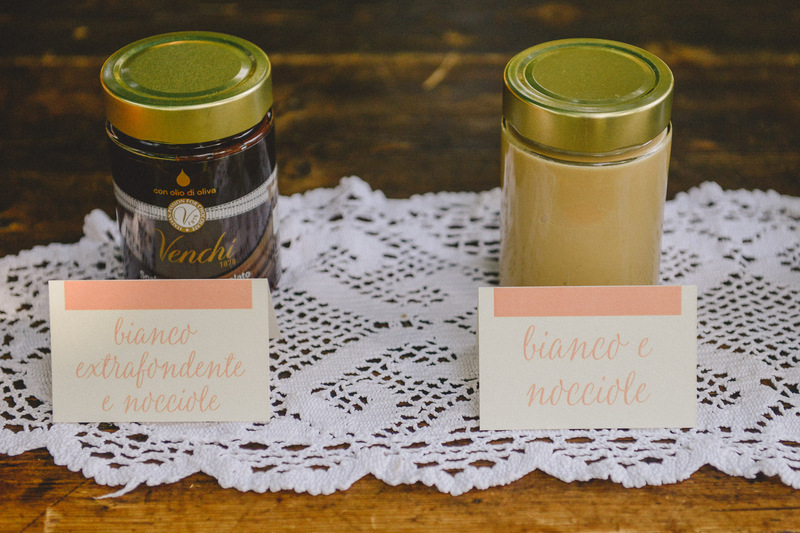 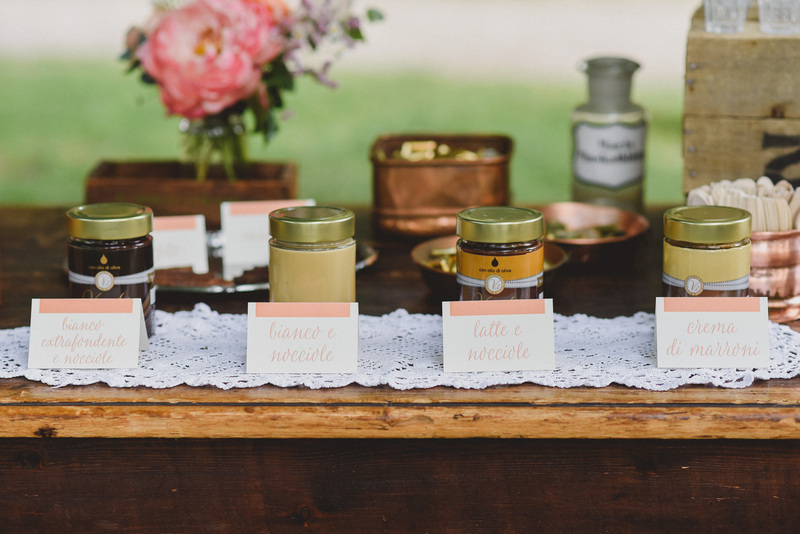 They had a religious ceremony in a Catholic church and then the reception at the farmhouse “Granai Certosa“, famous because of their biological and km 0 products (the favors were amazing honey jams!). 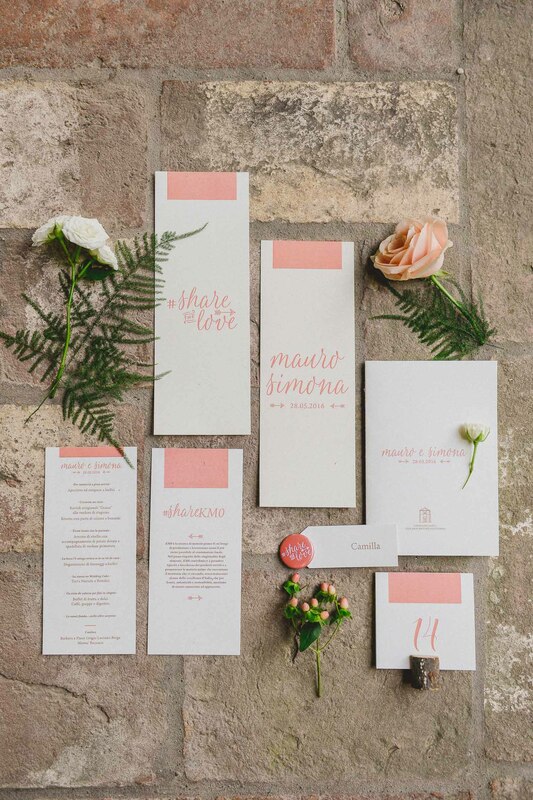 The color palette for this project was all about bright colours: coral, orange, peach, pink, green combined with natural materials like wood and kraft paper. 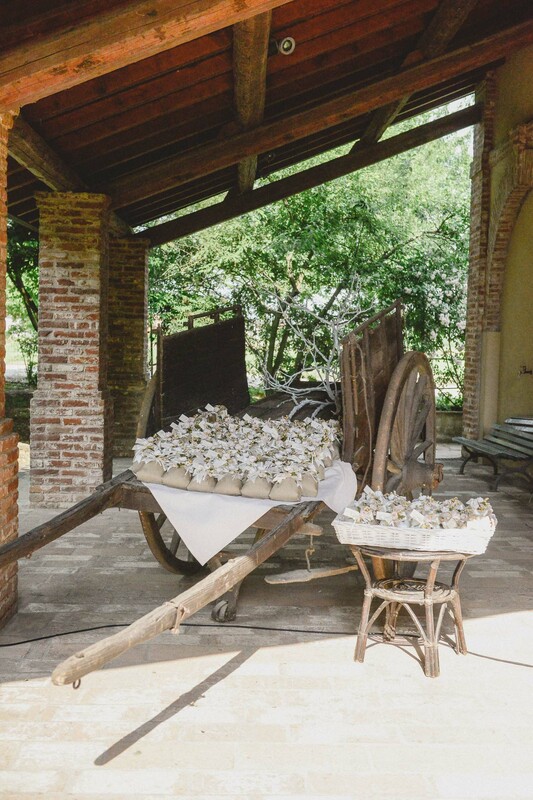 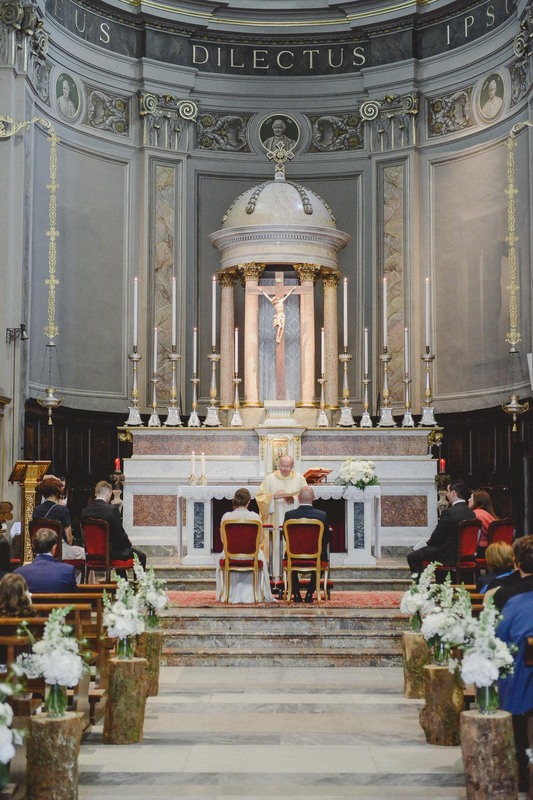 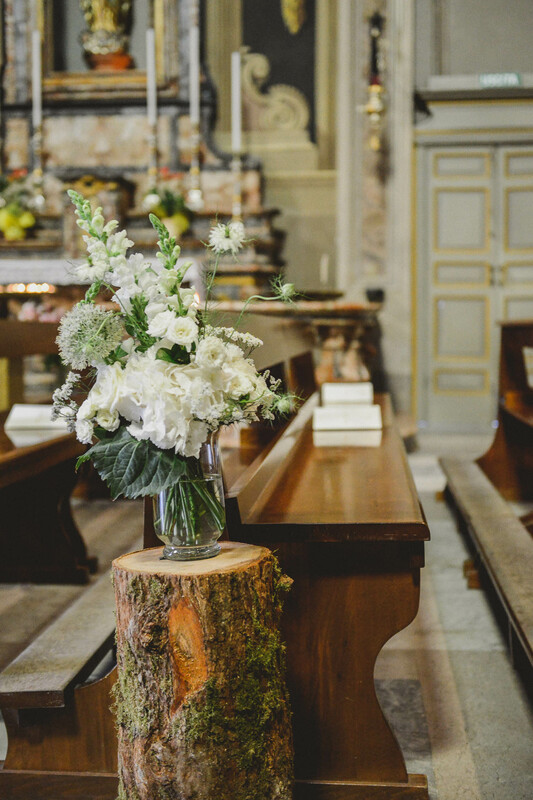 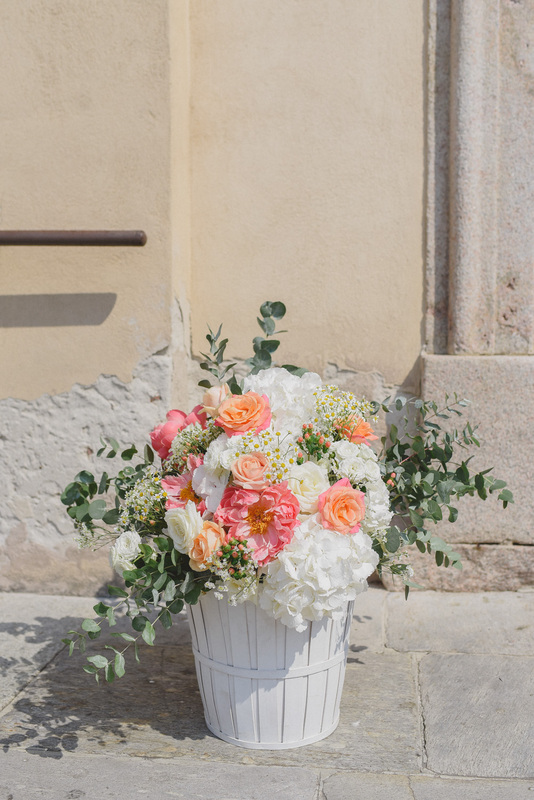 In the church I loved the decorations by Il Profumo dei Fiori with wooden tree sections, transparent vases and white composition of flowers along the aisle, 2 big baskets full of peonies, David Austen roses, garden roses outside the church and drawers with rice! 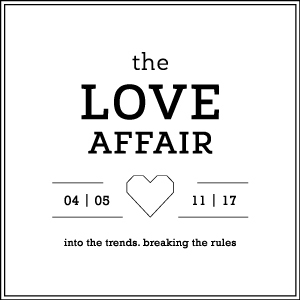 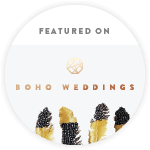 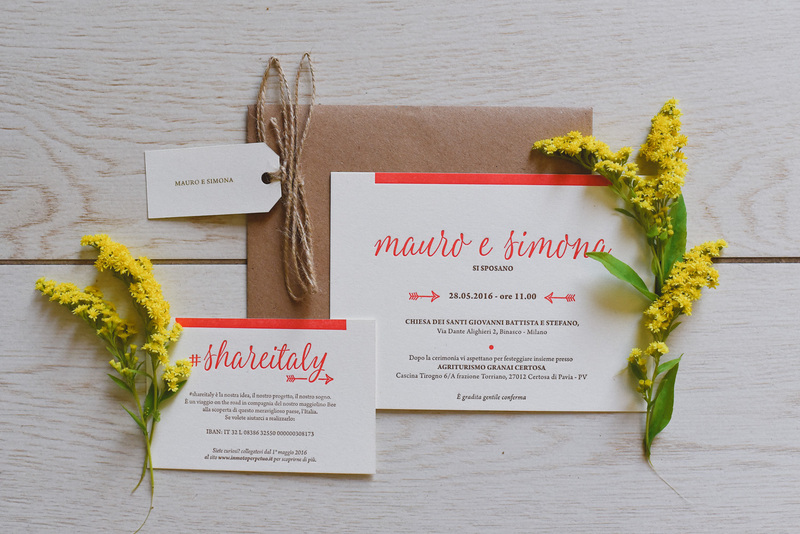 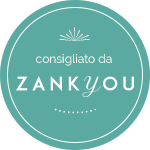 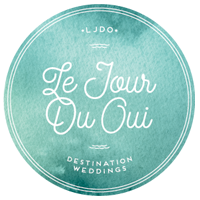 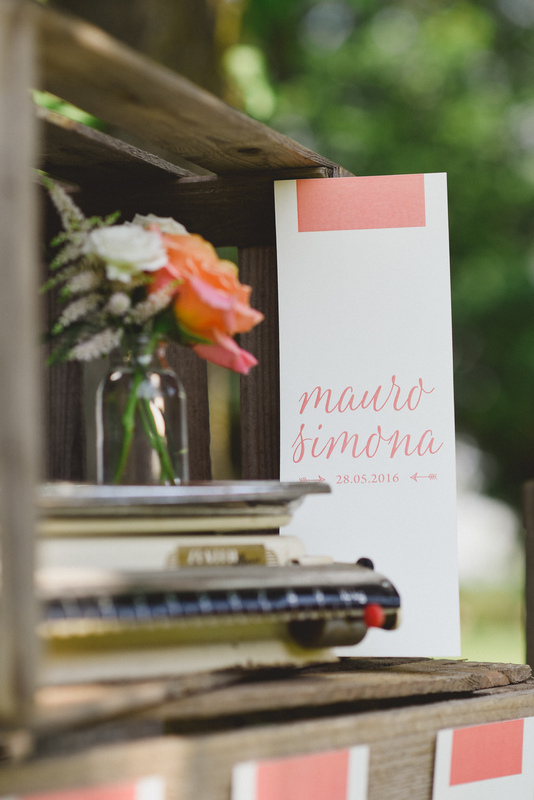 The graphic design had great rilevance in this wedding: the guys completely trusted our creative project and that one of Letterink, who created amazing things. 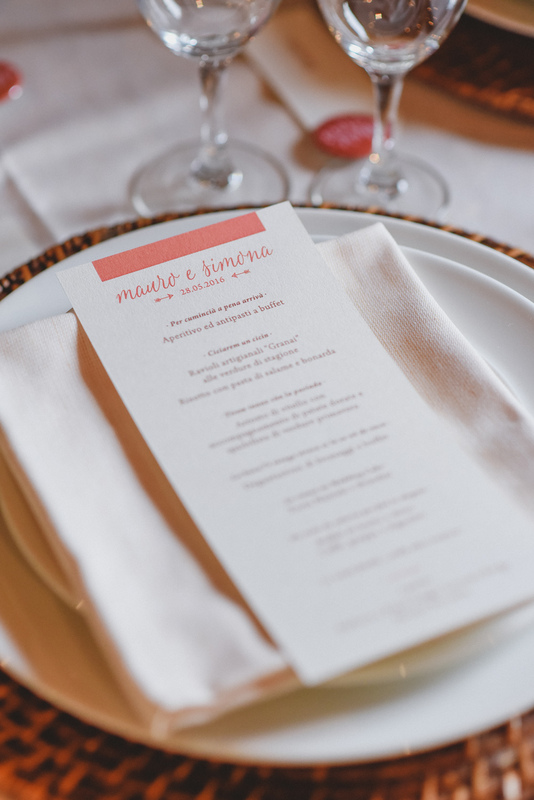 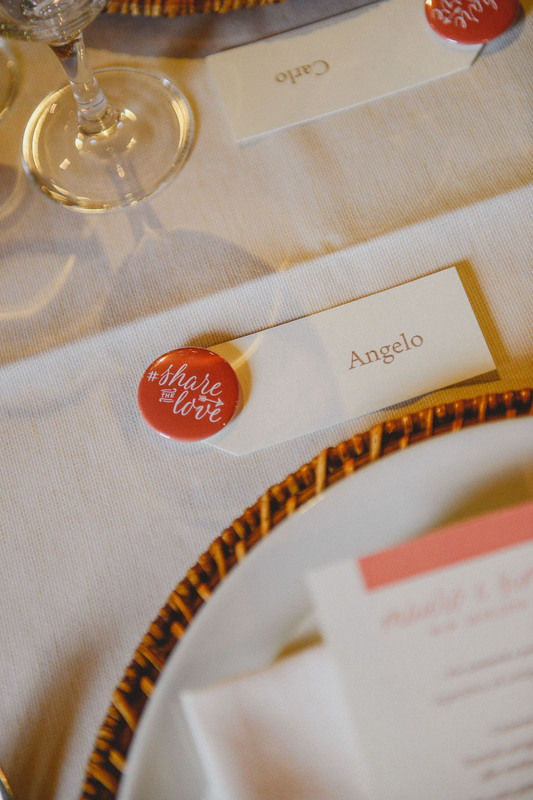 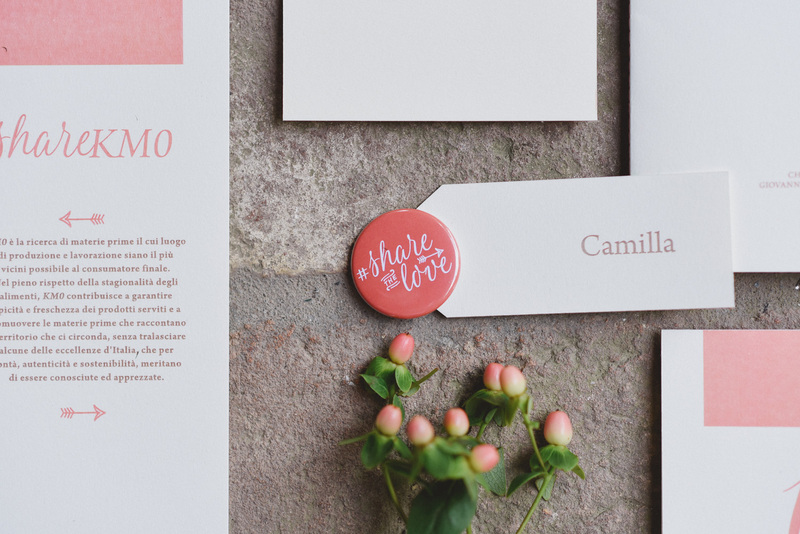 They used a bright coral for the main words with lettepress printing for the invitations, the menus, the seating plan and personalized pins for the guests. 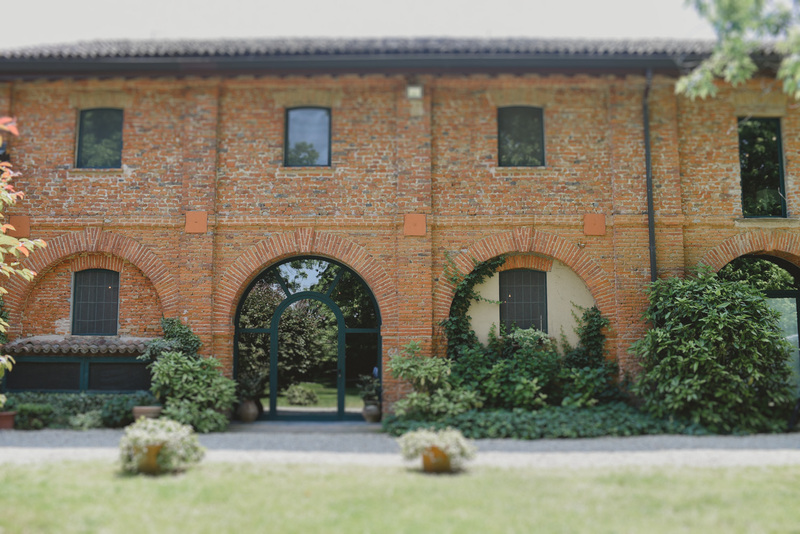 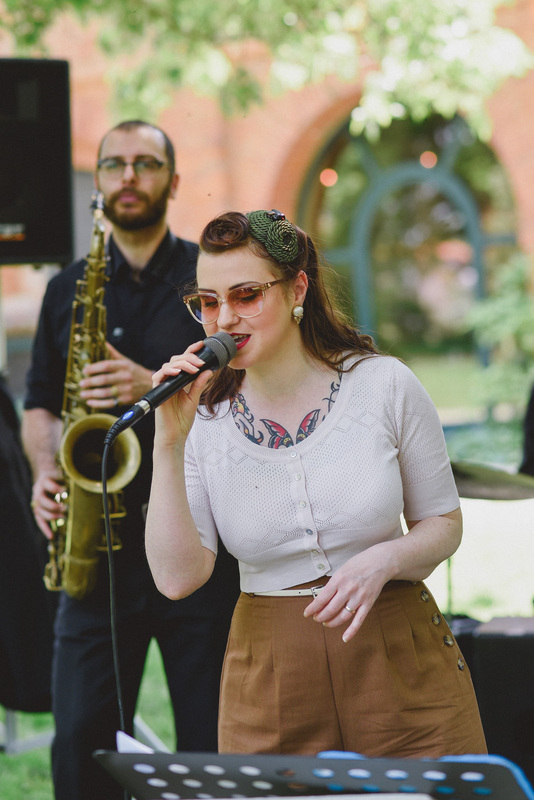 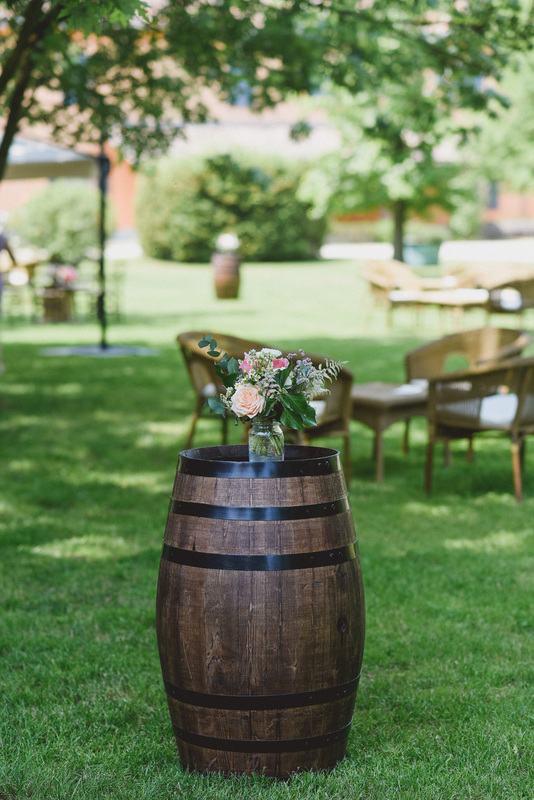 We’d like to enjoy all the outside space because it was a daytime wedding and we were lucky because it was a sunny day. 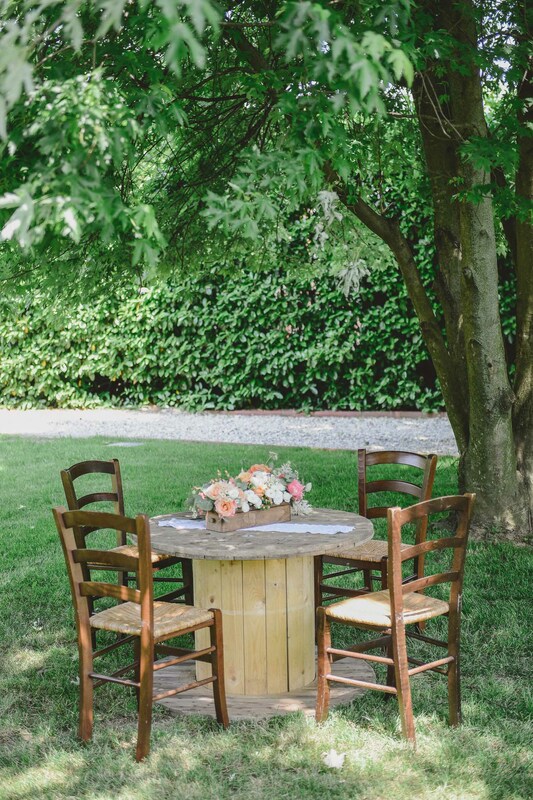 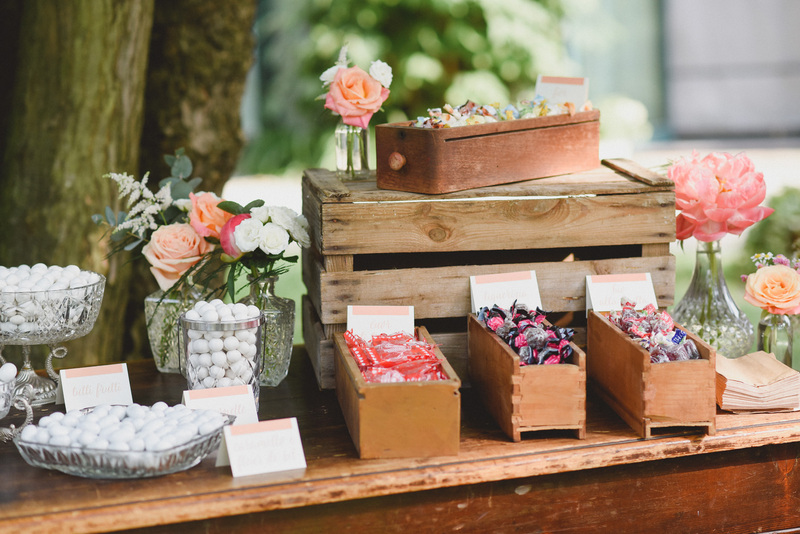 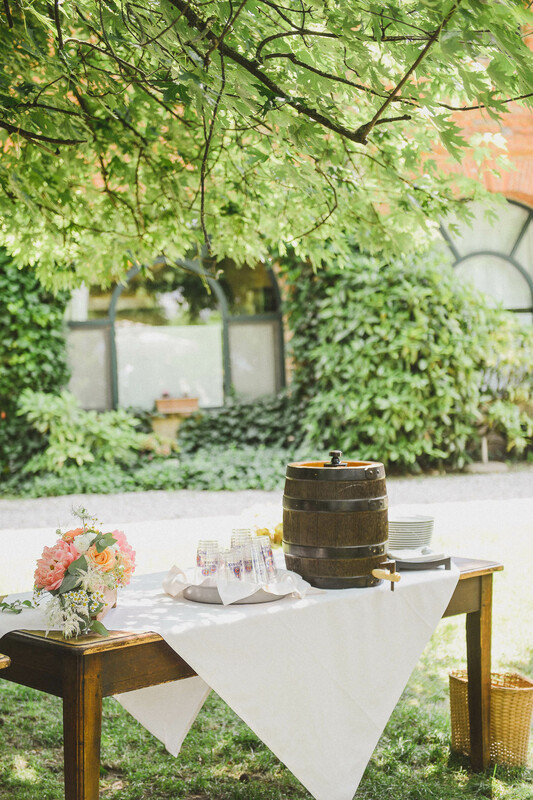 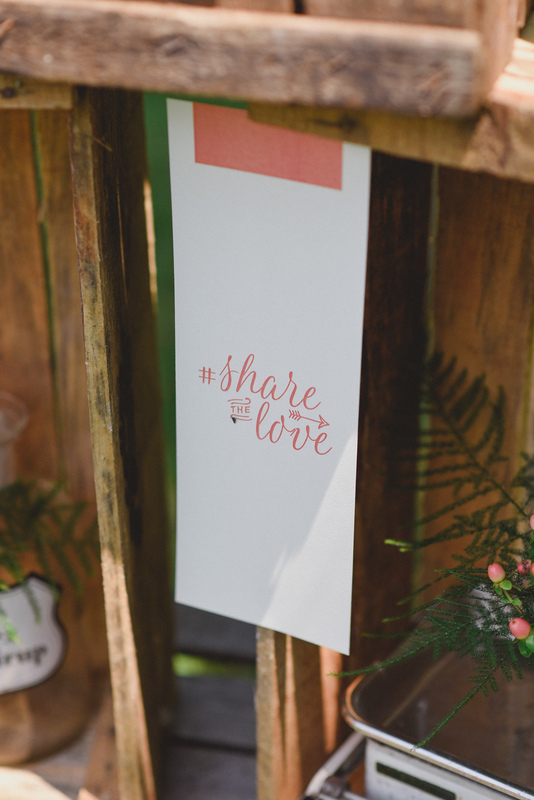 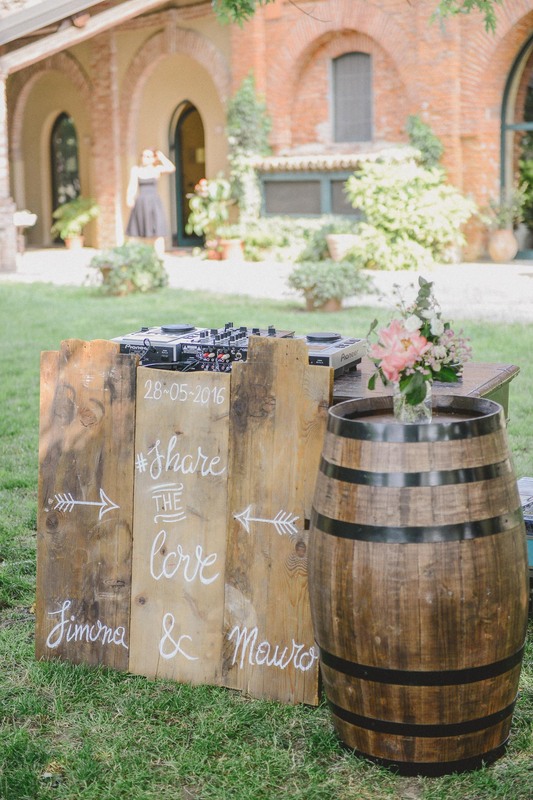 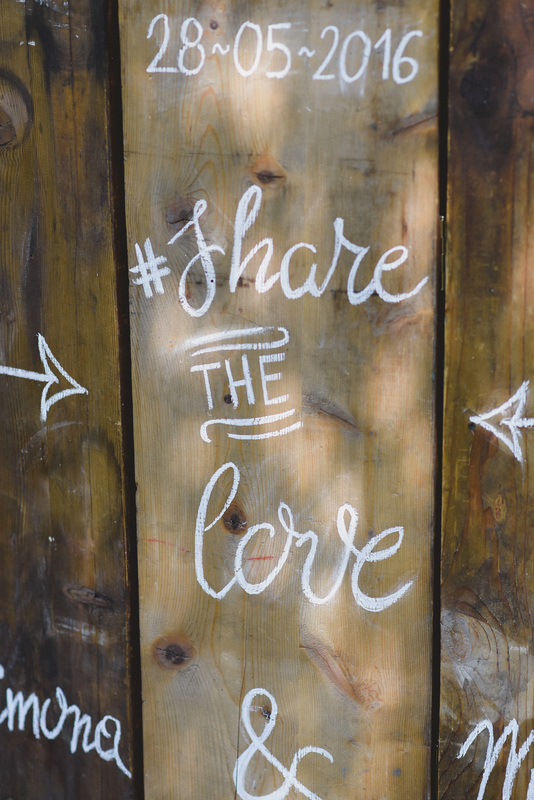 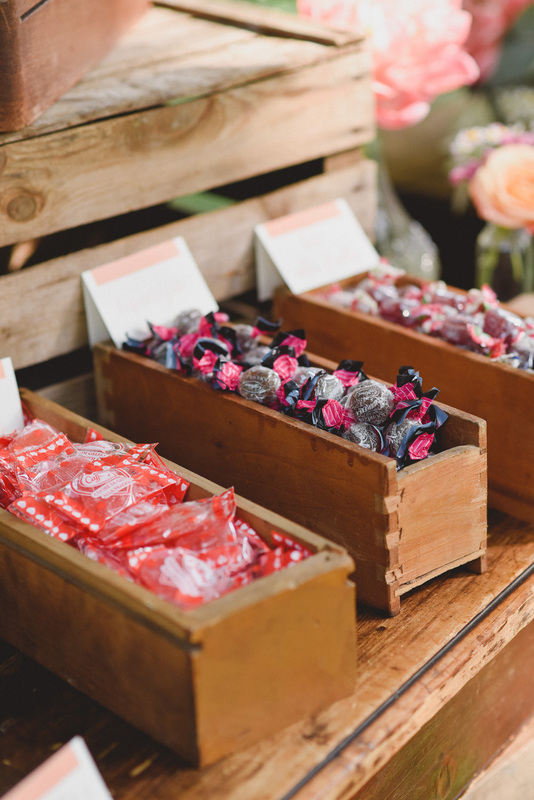 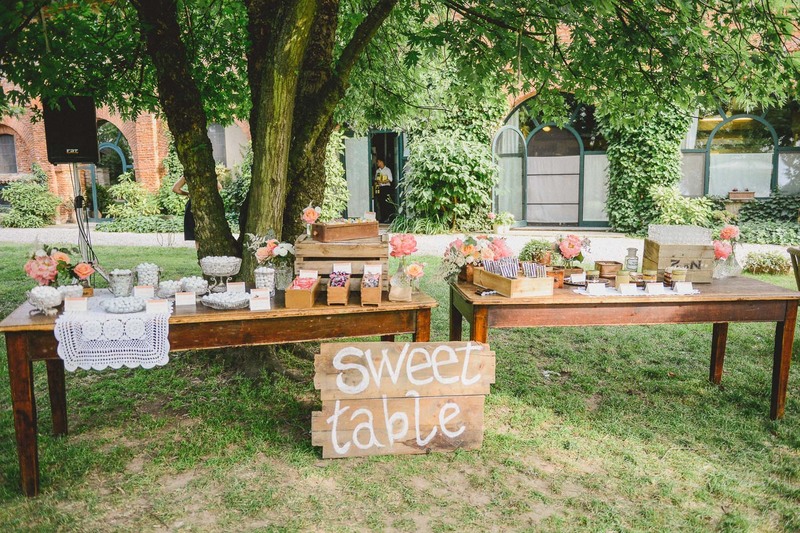 Under the trees, we placed seating areas with bobbins and barrels decorated with flowers, and wooden signals with the Bride and Groom hashtag #sharethelove. 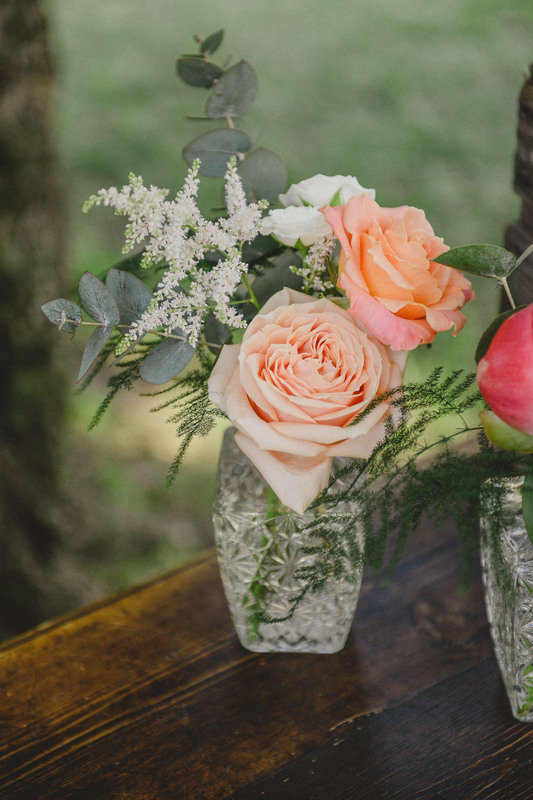 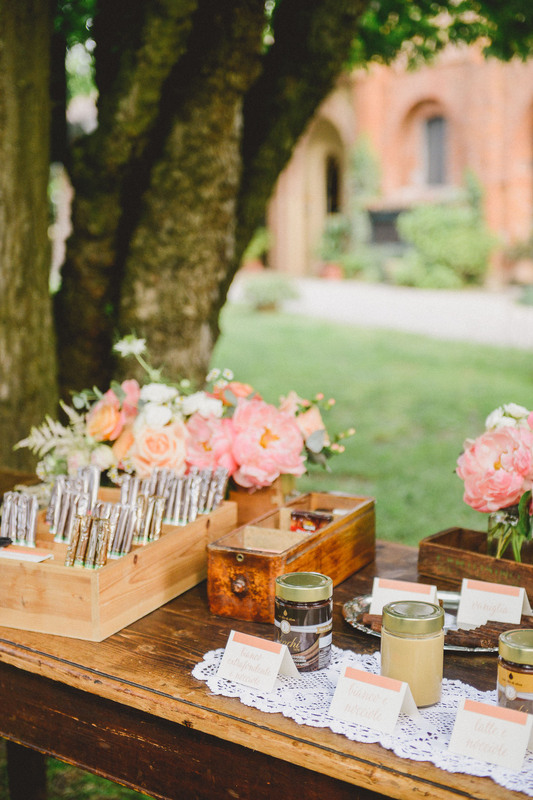 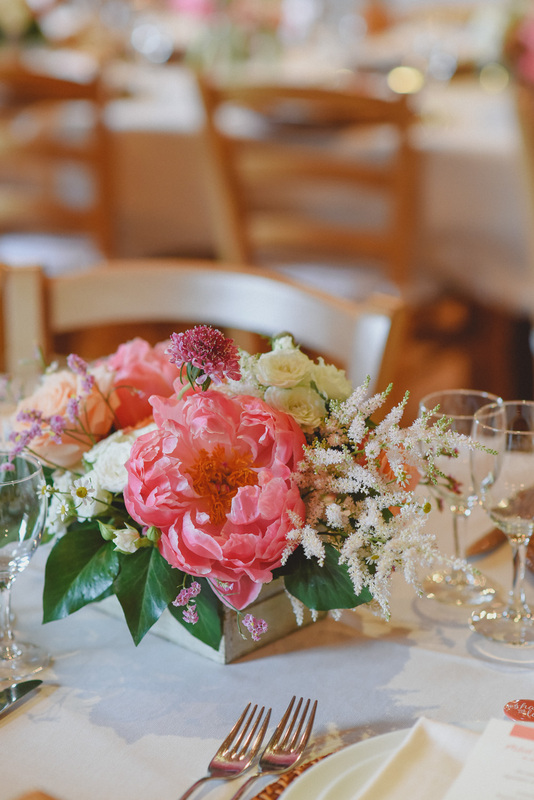 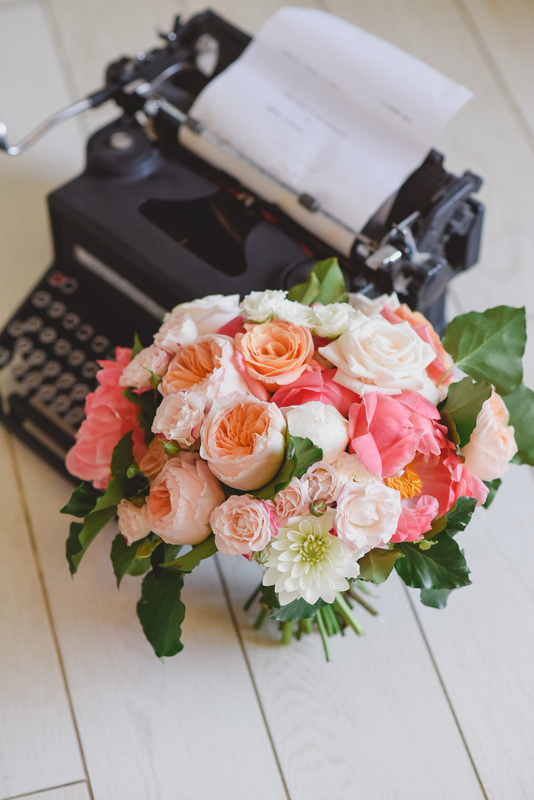 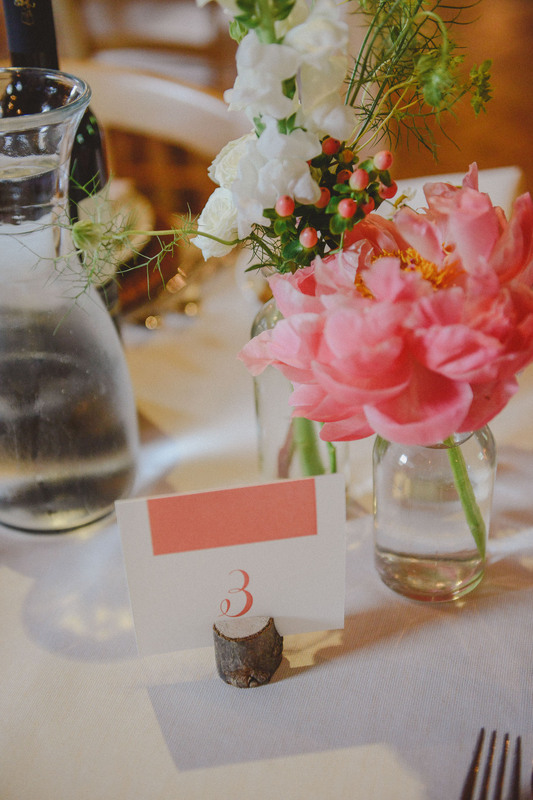 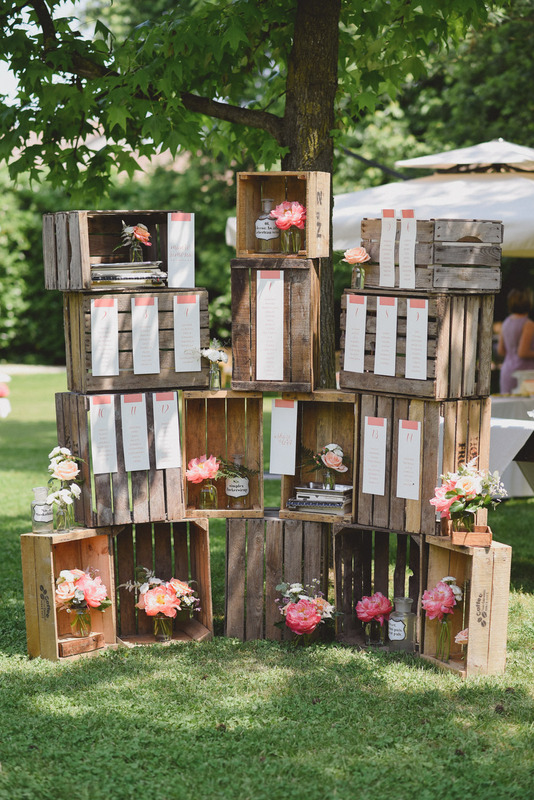 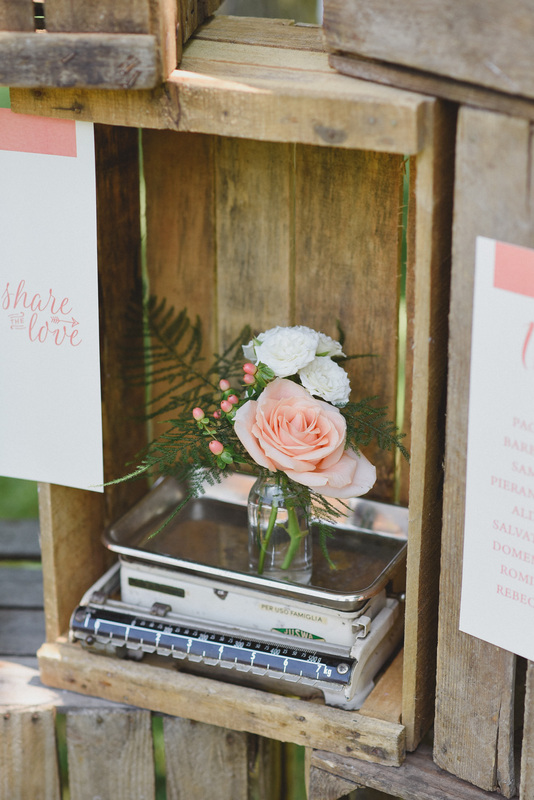 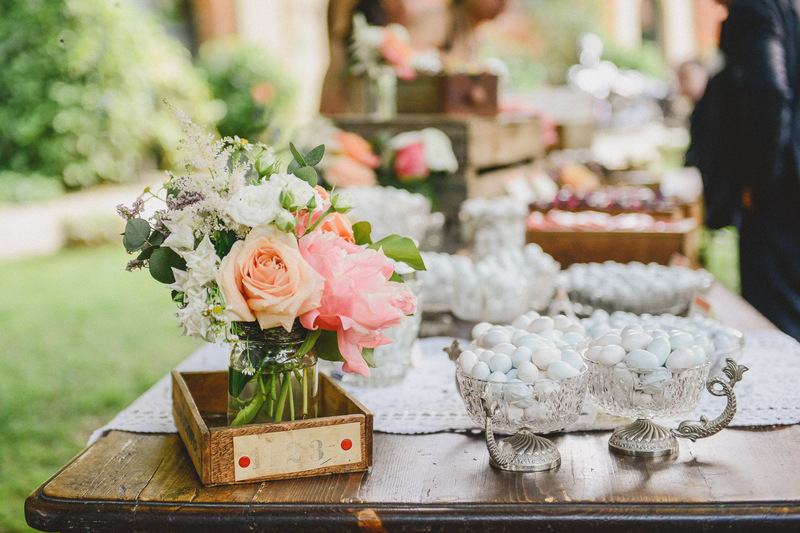 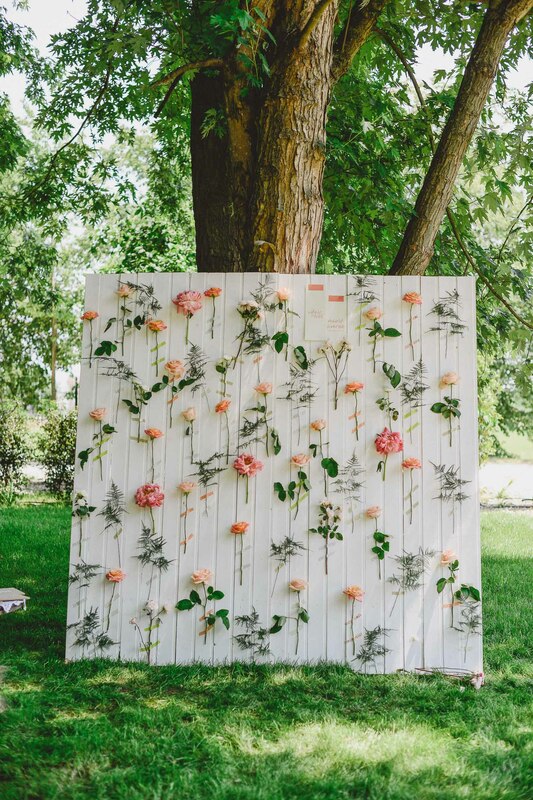 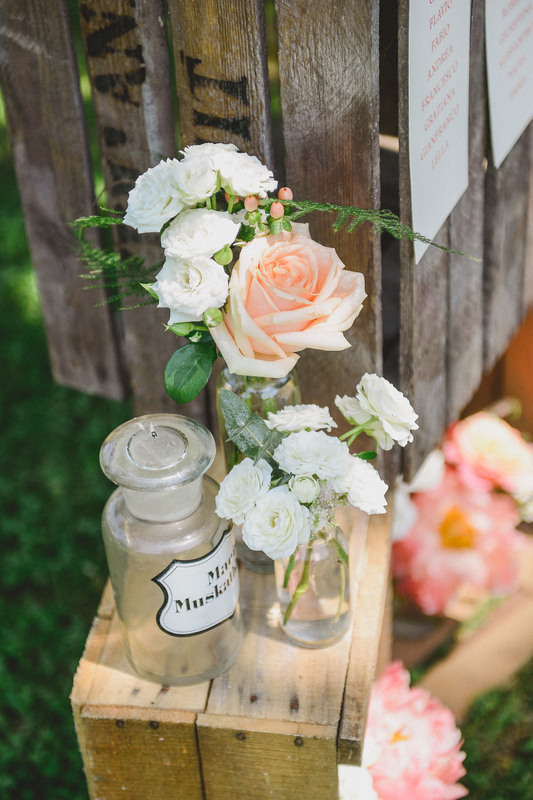 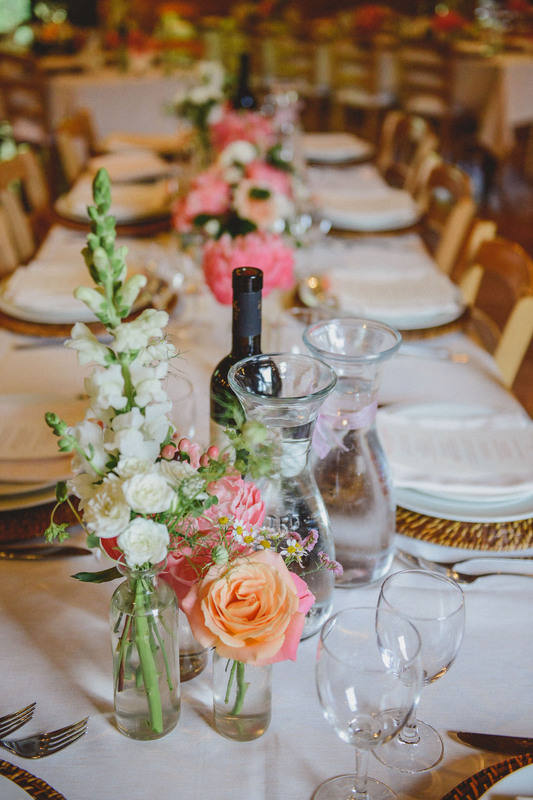 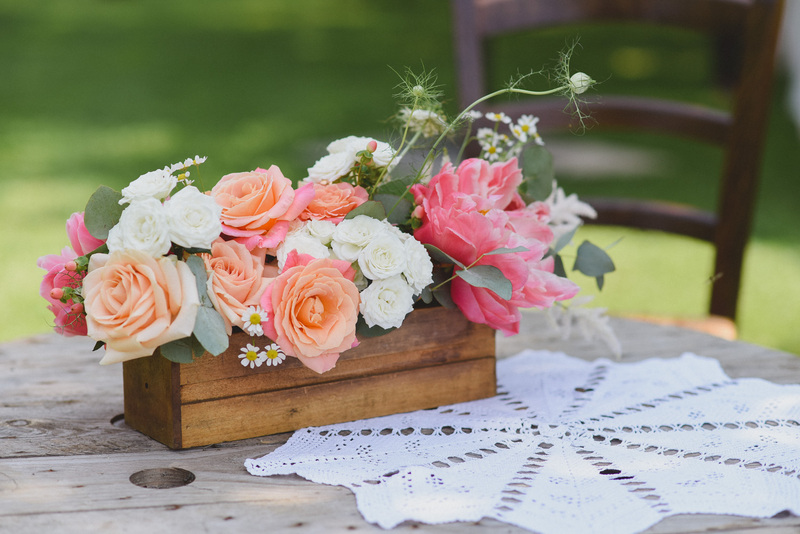 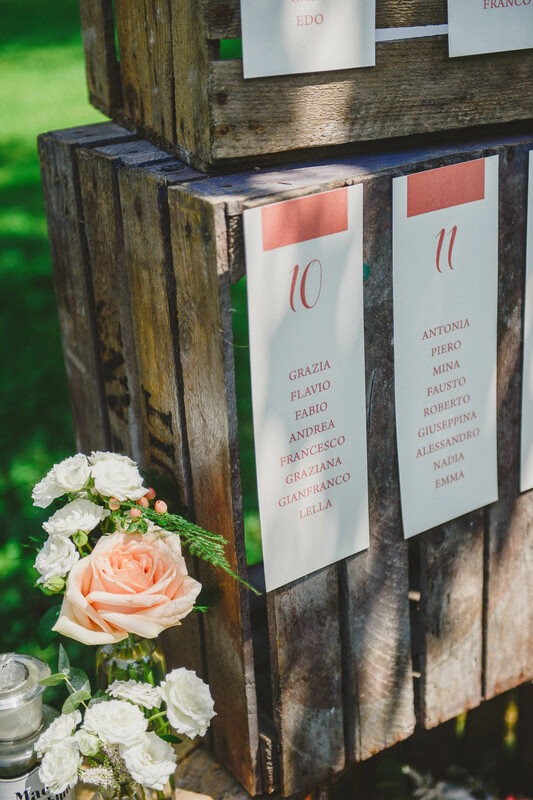 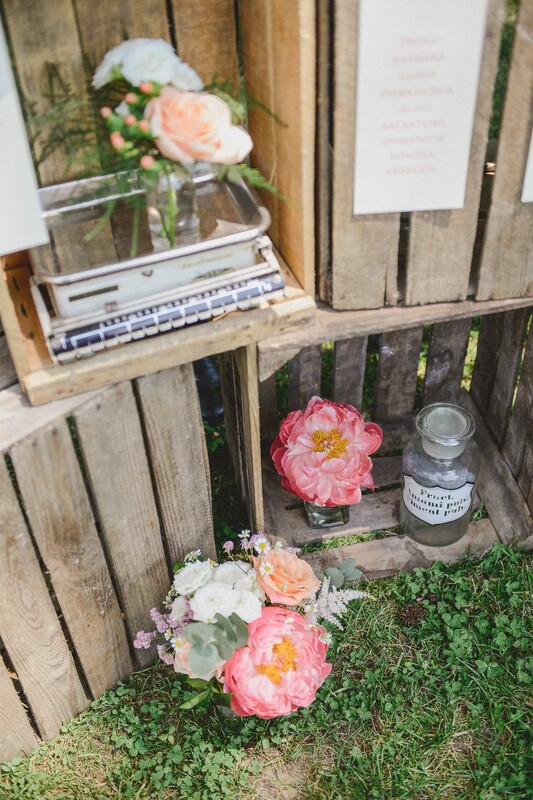 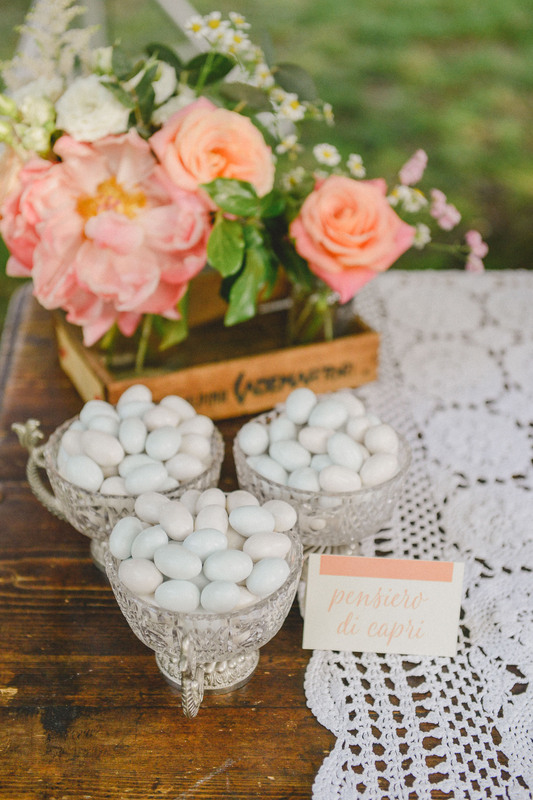 The seating chart was made by wooden boxes and vintage objects like pharmacy bottles with coral peonies and roses. 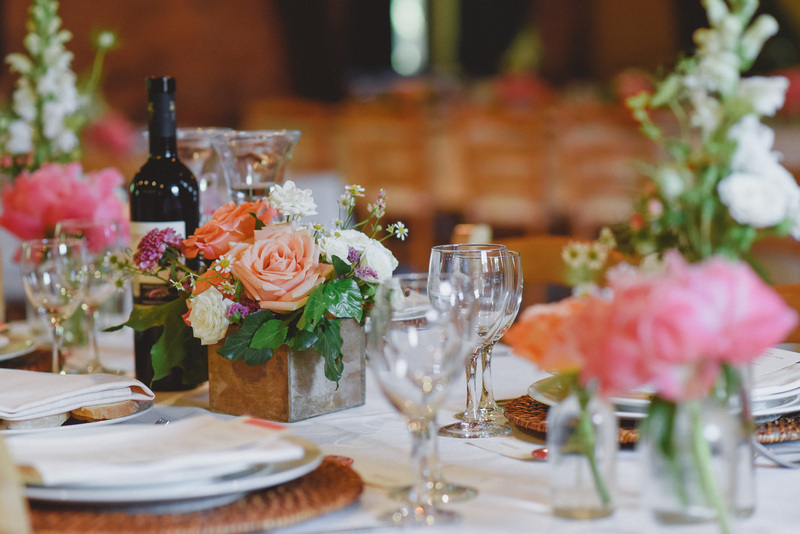 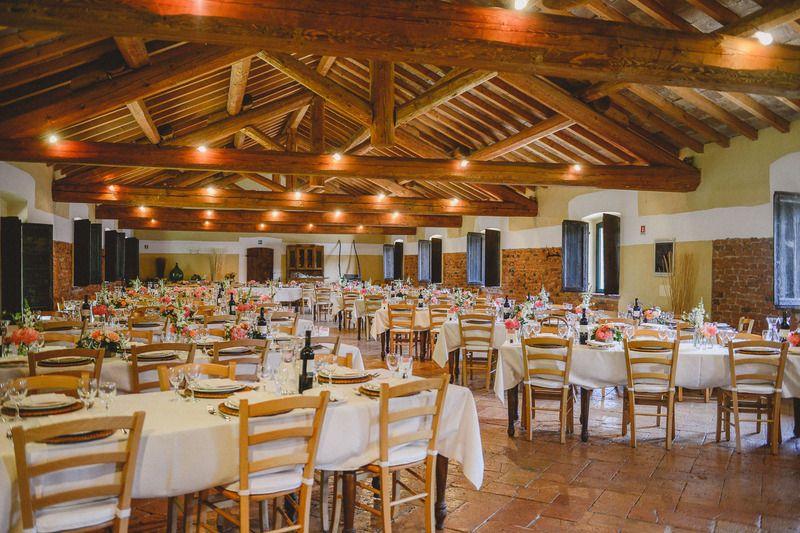 The lunch was inside into a beautiful huge room: rectangular tables decorated with rustic elements like wicker underplates and wooden table numbers…but the bigger surprise was still to arrive. 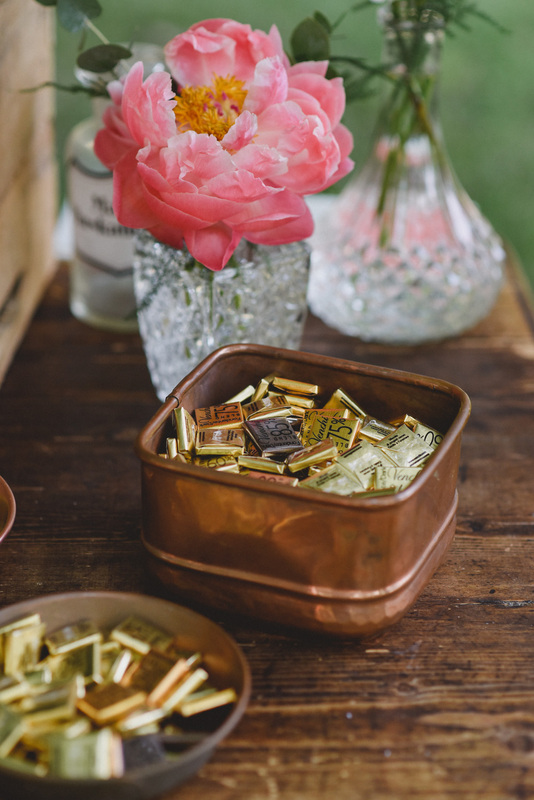 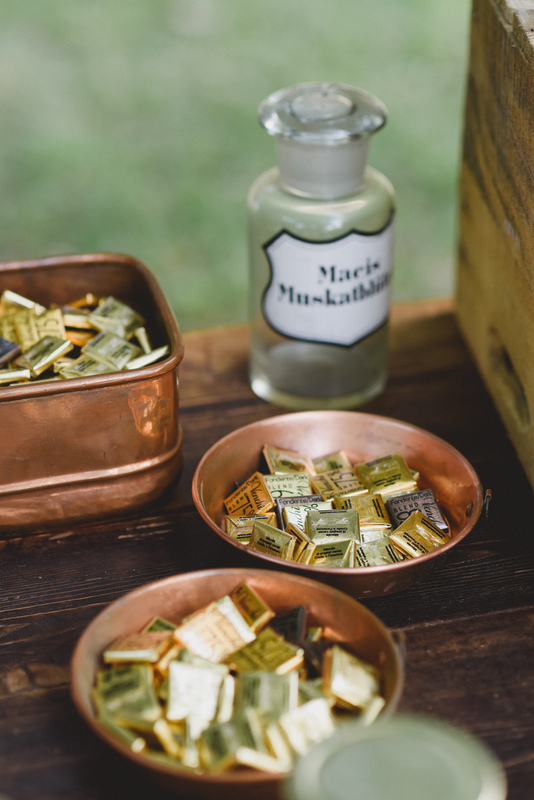 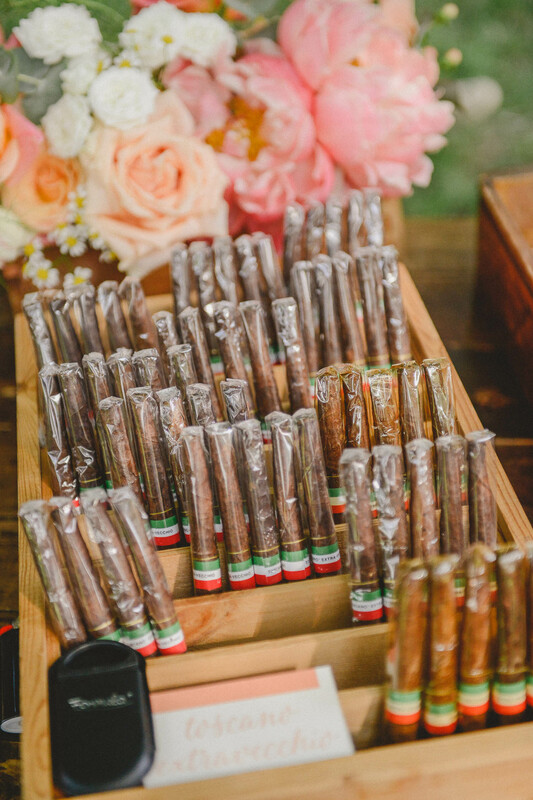 When the guests finished the seated lunch, they discovered a stunning sweet table: not only almonds sweeties (typical of traditional Italian weddings) but also a selection of premium chocolates (pralines and creams) and flavored cigars placed in vintage copper, silver and crystal bottles, bowls, trays and drawers! 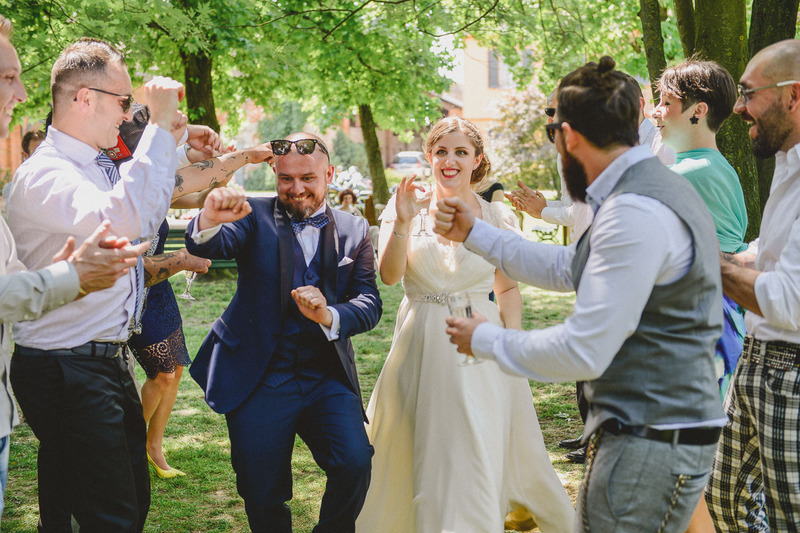 The music, thanks to Desafinado Music Planner involved people from the beginning, they dance and sing from the beginning with the Lady Dillinger band till the end with the DJ set. 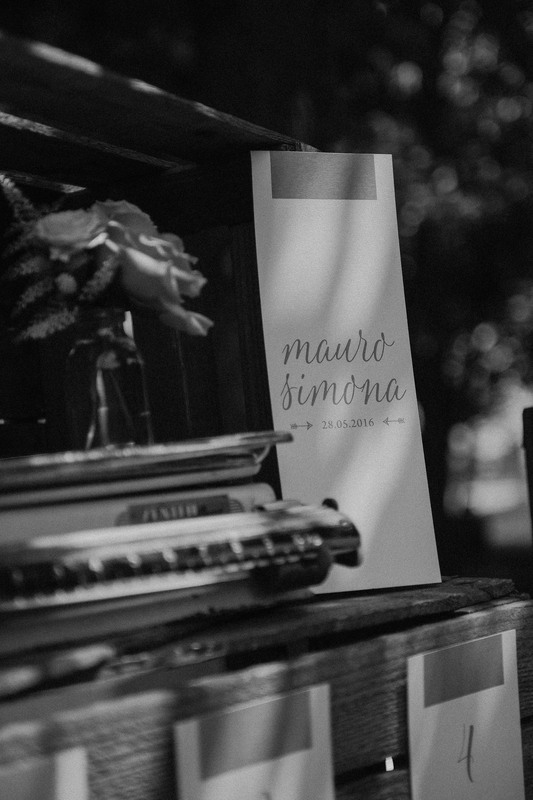 I close with some nice words from the Bride, thank you Simona and Mauro, we wish you all the best! 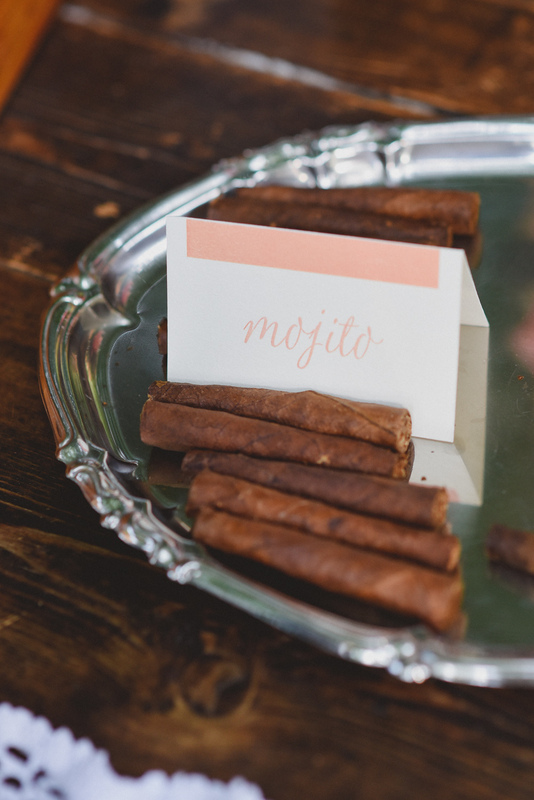 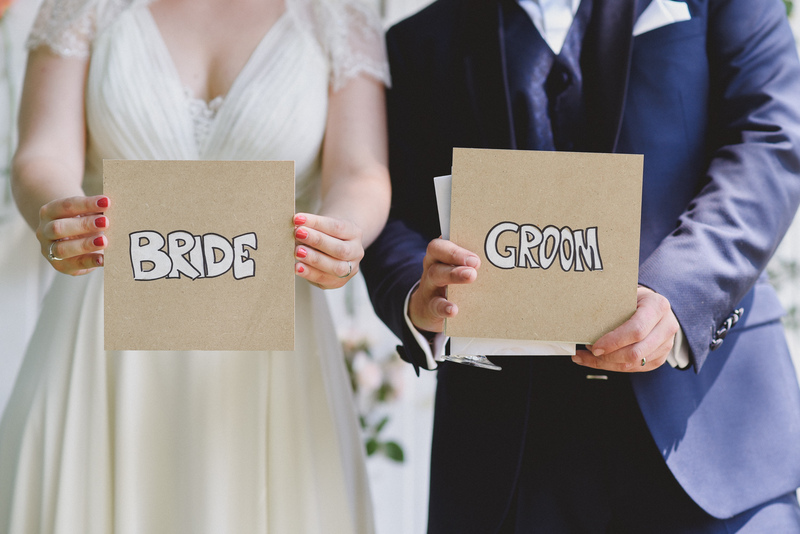 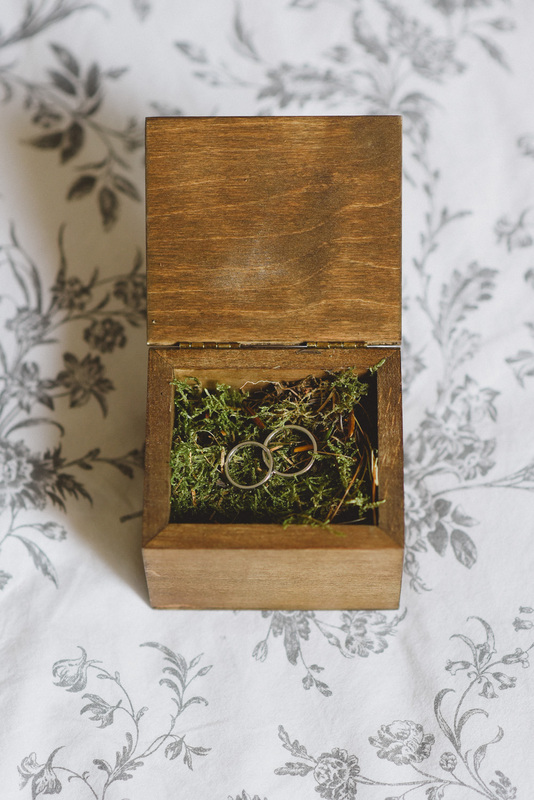 “I was sure to know exactly what I want for my wedding, but I couldn’t be wronger. 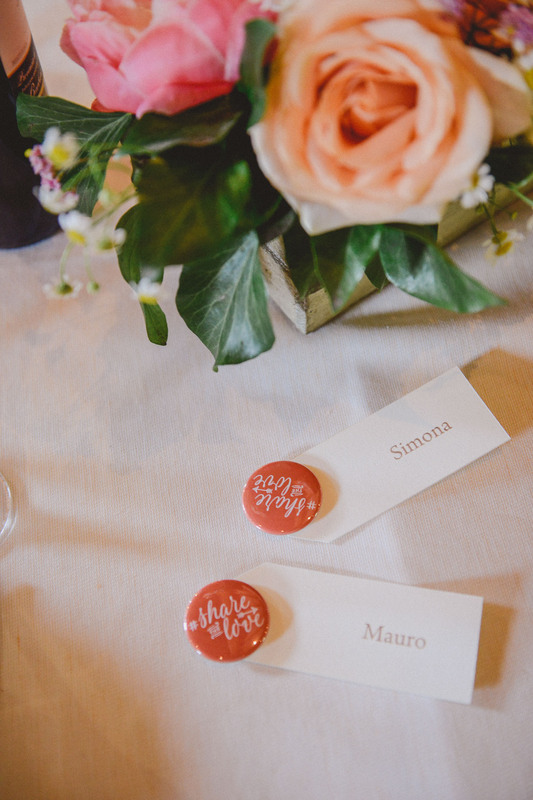 I thought I needed only somebody who coordinated the wedding day. 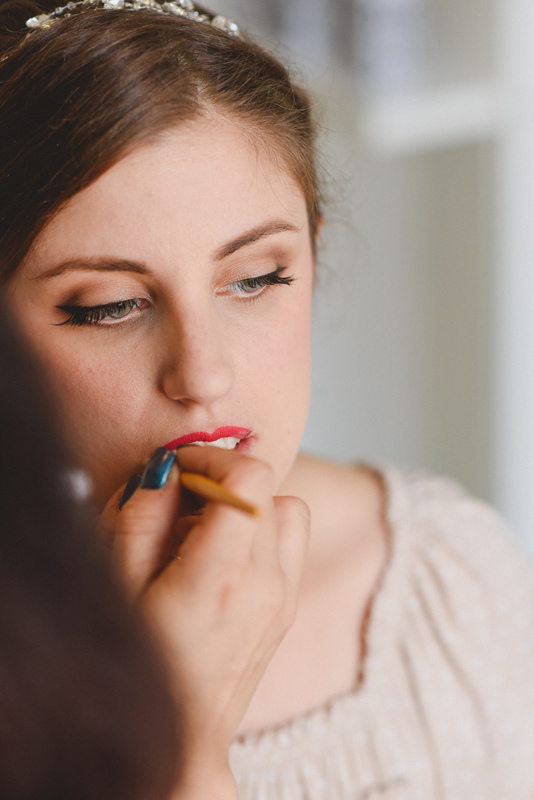 But without her and her wonderful team, I would be lost. 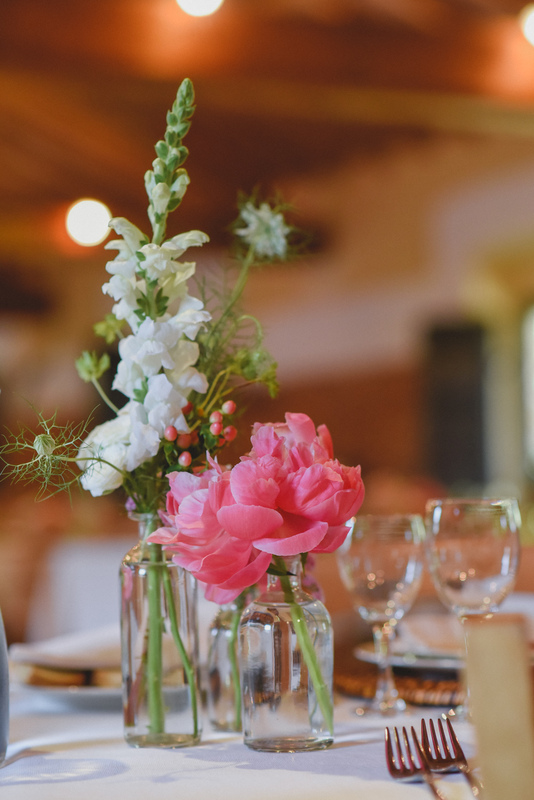 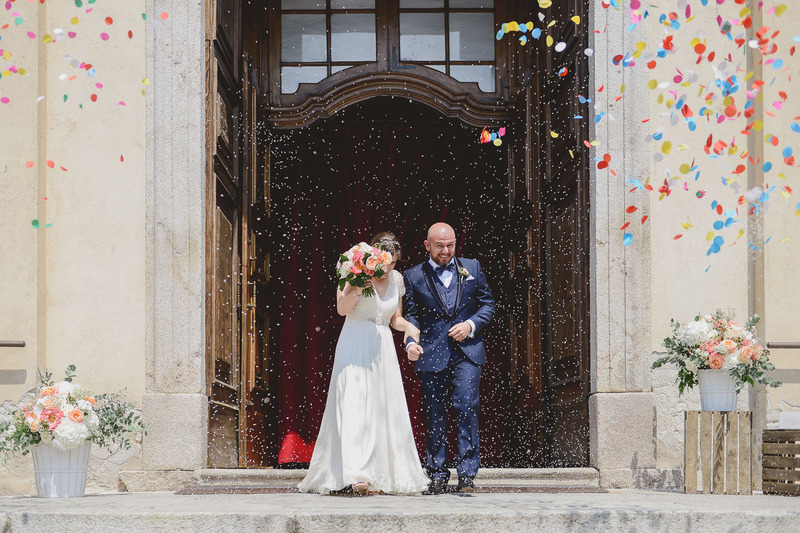 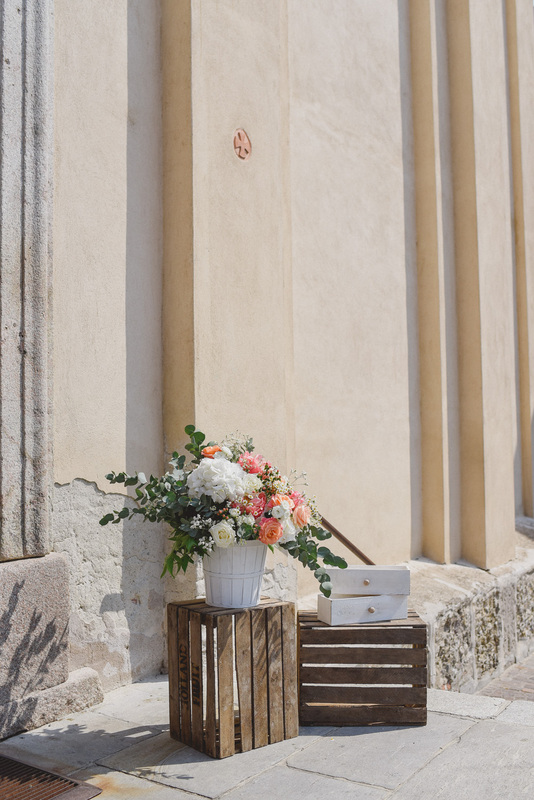 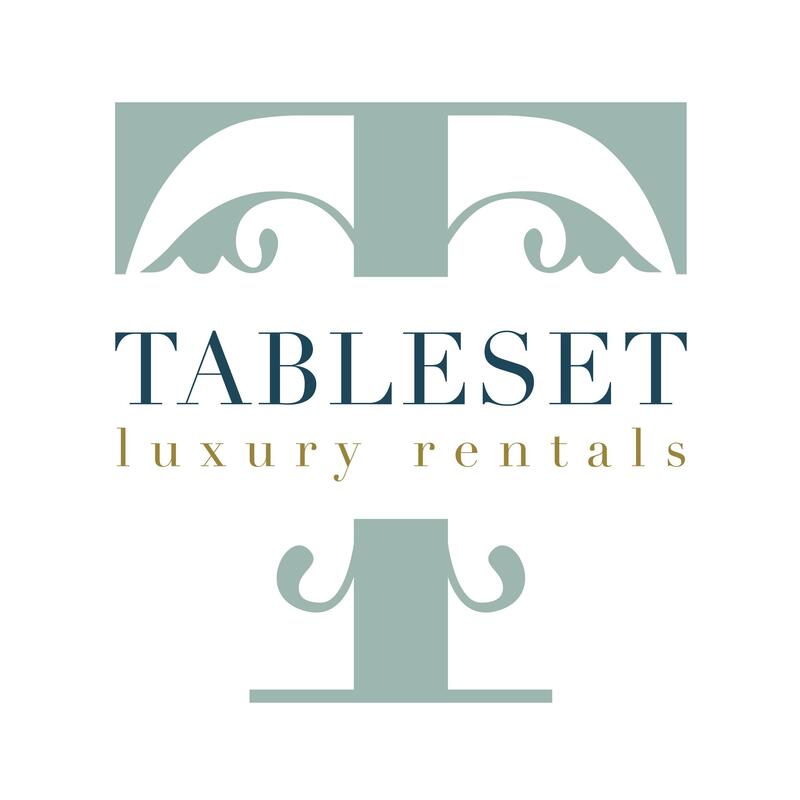 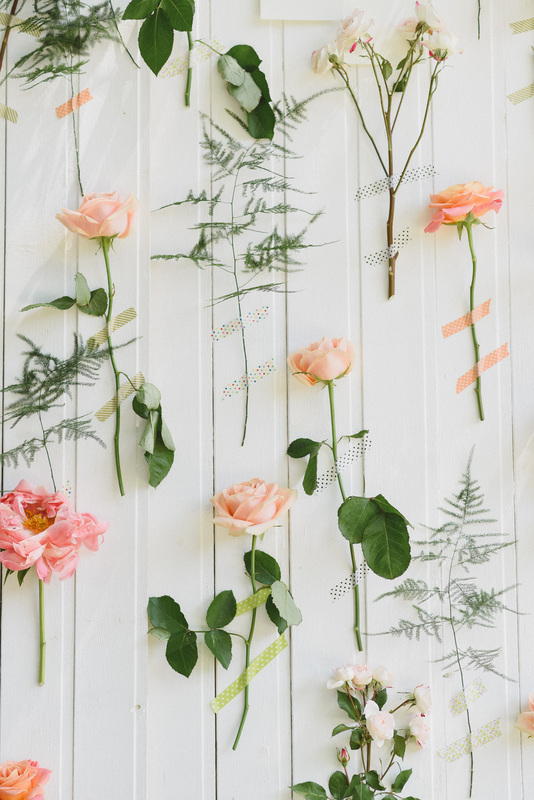 Cristina is not only a wedding planner: sure, she has patience and creativity, but she’s able to go further and the results of her work are the concrete proof. 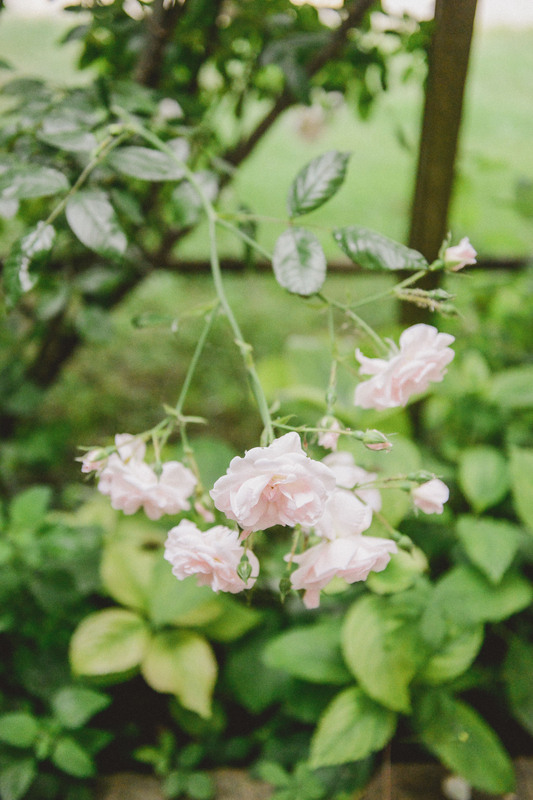 She has the extraordinary gift of understanting the desires of the people, even if they don’t know what they want, and producing a real dream. 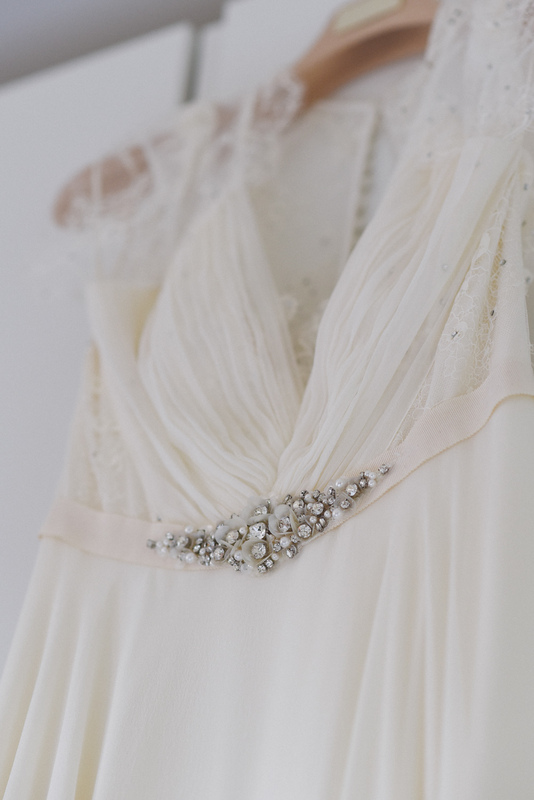 The attention to details, the love for the Beauty, the true passion for her work, the poetry of her settings. 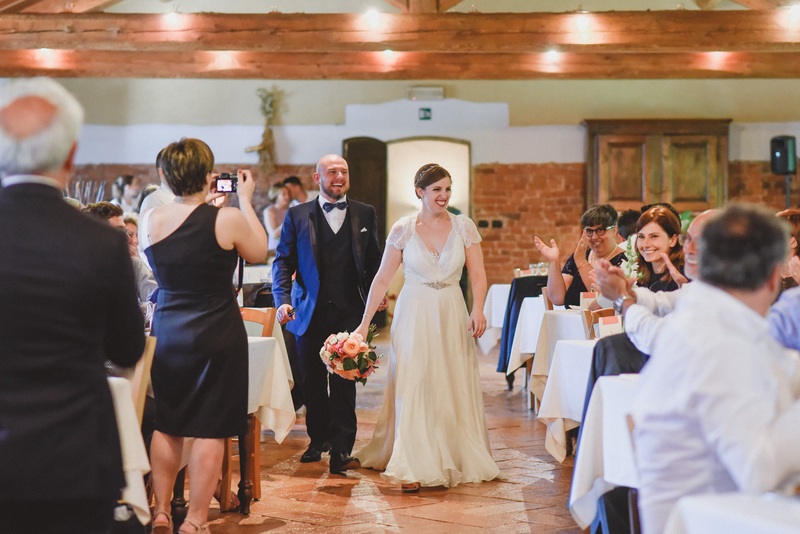 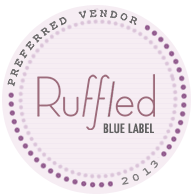 The nice persons who have worked with her, Lucia and Michela, and the vendors involved in our project confirmed everything I said.